4/18/2019 1:14:13 PM - Jim Hall, born in Buffalo, and educated at the Cleveland Institute of Music, moved to Los Angeles where he began to attract national, and then international, attention in the late 1950s. By 1960 Jim had arrived in New York to work with Sonny Rollins and Art Farmer, among others. His live and recorded collaborations with Bill Evans, Paul Desmond, and Ron Carter, are legendary. Not only is Jim Hall one of the jazz world's favorite guitarists, but he has also earned critical acclaim for his skills as a composer and arranger. The first formal recognition came in 1997, when Jim won the New York Jazz Critics Circle Award for Best Jazz Composer/Arranger. His pieces for string, brass, and vocal ensembles can be heard on his "Textures" and "By Arrangement" recordings. His original composition, "Quartet Plus Four," a piece for jazz quartet augmented by the Zapolski string quartet, was debuted in Denmark during the concert and ceremony where he was awarded the coveted Jazzpar Prize, and later released on CD. In addition to the recent focus on orchestral and choral composition, Jim remains active as a player, working and recording with a variety of ensembles all around the world. In addition to working with his trio, Jim likes to spice up the mix with various guests. From time to time you might hear Joe Lovano, Greg Osby, the New York Voices, Kenny Barron, Pat Metheny, Slide Hampton, and others, working for a night or two with Jim's groups. In fact, several of these guests can be heard on a live recording titled "Panorama.” On occasion, these alliances lead to more intensive collaborative projects such as the “Jim Hall & Basses” recording featuring Scott Colley, Charlie Haden, Dave Holland, George Mraz, and Christian McBride, and the "duets" project with Pat Metheny. 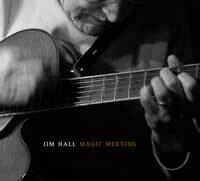 Jim’s latest project, “Magic Meeting,” a CD featuring the Jim Hall Trio with Scott Colley and Lewis Nash, was recorded live at the Village Vanguard in New York City at the end of April 2004. Jim’s new website (www.jimhallmusic.com) enables him to share with his audience a personal view of his creative process, in addition to the finished product. Via the web, audiences can participate, not just by purchasing the new CD, but by ‘being there,’ behind the scenes, so to speak, witnessing Jim prepare for a project, meeting the players, hearing the outtakes, and more. Some years ago, Guitar Player magazine quoted Jim as saying "I do feel good about my playing. The instrument keeps me humble. Sometimes I pick it up and it seems to say `No, you can't play today.' I keep at it anyway though." Jim and his wife, Jane, who is both a psychoanalyst and a songwriter, live in New York City’s Greenwich Village with their dog, Django. This bio was excerpted from “Sketches from PROS Folios: Jim Hall” by Devra Hall, and permission is granted for its use in program books and promotional materials. Whenever possible, please include an author’s credit. Jim Hall biography in PDF format. Long format for promotional use. A list of Jim Hall recordings, videos, and print materials from the 1950s to the present. This downloadable pdf file was compiled by Devra Hall. Jim Hall biography in PDF Format. Short format for promotional use.